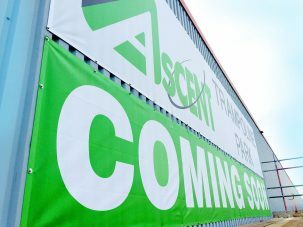 Need a MESH PVC printed banner FAST for an outdoor event, building wrap advertising or even a construction site or fence? Look no further. Our express mesh banner printing service can provide you with mesh banners that are perfect for any location, especially exposed outdoor spots. That means those worried about their banner’s ability to endure the elements can rest easy – our mesh creations are full of tiny holes that let the wind pass right through, making them the perfect survivors against strong gusts. Our express mesh banner printing service is flexible too, allowing you to get exactly what you need, minus the fuss. Our products are printed up to 1.25 meters in one dimension – either width or height – with the remaining dimension completely customisable. As long as one dimension is 1.25 meters in length, you’re sorted. Before continuing please make sure that your artwork is print ready, and set to the correct dimensions. Once submitted we will check your artwork. However, please be aware that once the order is placed and payment is taken, cancellation is usually not possible. Please make sure you are aware of the turnaround times and artwork guidelines before proceeding. Please note: Delivery address cannot be changed once your order has been placed. By selecting upload later, you are agreeing to provide us with print ready artwork that is set to the correct dimensions. All artwork (up to 2GB) can be sent via bannerworld.wetransfer.com. Once submitted we will check your artwork. However, please be aware that once the order is placed and payment is taken, cancellation is usually not possible. Please make sure you are aware of the turnaround times. Turnaround time will start from the time we receive your print ready artwork. Please note: Delivery address cannot be changed once your order has been placed. Please let us know of any specific instructions regarding your artwork or order. As trade suppliers we understand the importance that your parcel is sent in plain packaging. Please be assured that NO branding will be on your package inside or out. This means you can send your orders direct to your client. All items sent will contain no Banner World branding whatsoever. No literature inside your package. Standard turnaround is 1-2 working days from receipt of order, print-ready artwork and cleared payment. Suitable for banners up to 1.25m high x any length – or 1.25m long x any height. Excellent banner which looks superb outside our premises on the fencing. 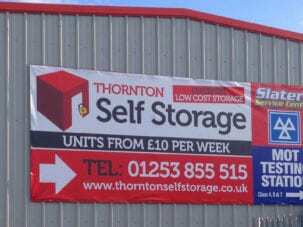 How Can Advertising On Mesh PVC Banners Help My Business? 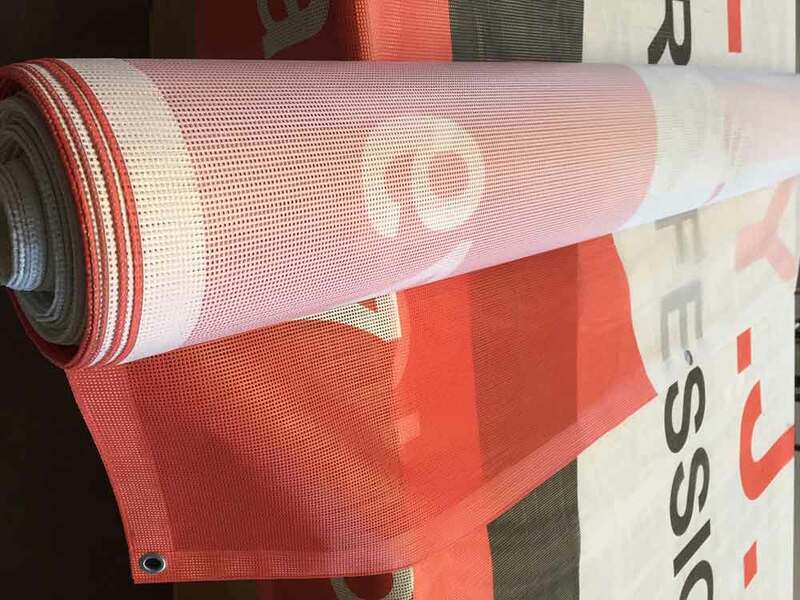 What makes our express mesh banner printing service so special? Well, lots really. For starters, the quality of our PVC mesh banner products is second to none. Printed on 330 GSM material (that’s grams per square meter), our banners are both scratch and fade resistant. In short: they’re built to last, regardless of indoor or outdoor use. They’re also B1 fire protected so those hoping to use our PVC mesh banners for a form of advertising, a pedestrian barrier or on a fence or scaffold can do so in the knowledge that they’re hazard free. Want customisation? That’s fine too – it’s your order and you’re in control which means all of our banners can be finished to your exact specifications, complete with bespoke artwork. As if all this wasn’t enough, all of our printed PVC mesh printed banners come with hems and eyelets included within the final price. How Much Does Express Mesh Banner Printing Cost? Our low and competitive prices are the cherry on the cake of your banner buying experience. Order today via our simple to use three-step checkout service and you can secure the perfect PVC mesh banner from as little as £17 per square meter. That includes any original artwork, artworks or signage that you may want printed on your banner, free of charge. Plus with our super speedy delivery, it’ll be with you and ready to use within just 2-3 working days with no delivery charge on orders over £250. We’ll even help with fitting and framing options to make the whole process as easy as possible. With our express mesh banner printing service you can wave goodbye to any online hassle and say hello to your brand new mesh PVC printed banner in no time! Why Use an Express Mesh Banner? Our custom printed mesh banners are smaller in size than the standard mesh banners that we offer but what they lack in size, they make up for in practicality. These smaller mesh PVC banners can be produced quicker whilst retaining their high, durable quality so you get your product quicker, without cutting any corners. They can be used anywhere. Many clients use our products in outdoor or exposed areas as their mesh makeup sees them withstand strong winds and weather conditions with ease. 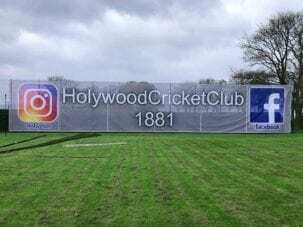 Each express PVC mesh banner is made up of thousands of tiny holes, allowing wind to pass right through and fully reducing the risk of structural wind-loading and external damage. Our express mesh banners are ideal for the use of safe pedestrian barriers, fences or on scaffolds in building sites or construction areas. Outdoor advertising using traditional PVC banners can be tricky. To start with their opaque material and finish does little to combat high winds, something that can often be encountered with banners used on construction sites, scaffolds or as fences. When strong winds strike, a ‘sail effect’ can occur and potentially cause damage to your PVC banner. If this happens, your message won’t be seen by anybody and that’s bad news. Also, using a traditional opaque banner as a window wrap reduces light levels within a building, which again isn’t ideal. Opt to advertise on a semi-transparent express mesh banner like the ones we make and you’ll avoid both of these issues and in turn, spread your message to a wide selection of potential new customers. Above all else you want your purchase to last and with our mesh PVC printed banners you won’t be disappointed. All of our products are printed on 335gsm material that relies on a high quality solvent technology to bring your bespoke creation to life. What does this mean? It means our banners can be created quickly and to an incredibly high standard. In fact, our express mesh banners are so durable, they can endure pretty much anything the elements can throw at them. Yep. You read that right. All of our full colour printed express mesh banners can be finished to your exact specifications at absolutely no extra cost. That includes hems and eyelets. Just tell us what you’re after and we’ll take it from there with no hidden fees. Traditionally used for flexface or illuminated backlit banners, there are now many low-profile banner tension frame systems on the market. Some allow the fast changeover of banners for seasonal promotions. These frames tension the banner like a drumskin, giving a solid sign effect. Check your tension frame specifications prior to ordering your banner – some require just additional material around the banner, some require specific pole pockets, some require a solid rubber edging welded in. Typically long length screws can be used, with large penny washers over the eyelets to protect the banner. It is vital to achieve the proper tension on banners fitted by this method – too loose and the wind will cause the banner to flap and affect hems and eyelets. Once fixing points have been completed on the wall – typically large eye or hook bolts – bungee clips or ties can be used to attach to the banner eyelets. This method tensions the banner as well as allowing some ‘give’ when the wind hits, thus protecting hems and eyelets. A steel wire frame can be run though eye bolts approximately 300mm outside the banner. Once the wire is tensioned, the banner can be fitted using a zig-zag of bungee cord. This gives the effect of a trampoline on its side, tensions the banner and allows some ‘give’ for high winds. We stock a variety of portable, easy-to-use, outdoor banner display solutions. These are ideal for outdoor events or special forecourt promotions. Set with no bleed - Make sure that there is a free area all around of at least 50mm for hem and eyelets. 1250mm in ONE dimension. ie. Your banner could be 10 metres x 1.25m. Before submitting artwork, please make sure you have read these guidelines carefully as we cannot accept responsibility for any incorrect printing due to setup / artwork error. All Text on files must be created to outlines, curves or paths. Please make sure text is converted before saving PDF files. All Files must be set to CMYK format. Please make sure there are no spot colours or pantones in your artwork as this can output unexpected results. As our service is a CMYK 4 colour process we cannot guarantee exact matches to Pantone, Ral or Spot colours. We can match Pantones if required at an additional charge. Please contact us prior to ordering as this is costed per job. We cannot guarantee an exact match on Pantone colours due to limitations of the CMYK print process but will try to achieve as close as physically possible. For certain items an artwork template is supplied on the product page. These templates are only for items which are set to a specified size. Ie feather flags / deckchairs etc. This will need downloading and your artwork setting on the template prior to ordering. If using the template please assign a separate layer for the artwork and save as a layered pdf, ai or eps file. Please embed images and create outlines on the type before saving. Overprints MUST NOT be used in files. Print file names much be as short and descriptive as possible. Correct Black Settings gives the print a deeper colour as sometimes using just black the image can look grainy and 'washed out’. If you have files with large amounts of black in the file, use the following guidelines. C50 / M50 / Y 50/ K100. C0 / M0 / Y50 / K100. All images must be embedded into the document. When ordering make sure you select the finished overall size of your banner including the pockets. So if you select a 1m wide x 2m height, then we will manufacture the banner to a total the height of 2m including the pockets. Please make sure that you leave a clear area for your pockets. The term ‘clear area’ means no items of text or logos. So if you have 150mm flat pockets top and bottom, please don’t let any text or logos to run into these areas. Please note that on a 1500mm flat pocket you will also need to leave an additional 25mm extra for the weld (so 175mm in total. Background colours or images are fine, just no readable text or logos. We have special software which flips certain parts of your banners so as to create a seamless pocket on the opposite side. When ordering a double sided banner please just follow the above steps, as the file(s) will need to be set up in the same way. If you require a different image on each side of your double sided banner not a problem, just upload x2 files stating that you require a different image on each side. For the full comprehensive guide on Pole Pockets click this link please refer to our Pole Pocket Guide here. Set your artwork without bleed or crop marks. On banners please remember to leave clear area all around of 4cm so not to conflict with the position of the eyelets. Please supply all files with 5mm bleed all round. Please don’t save the files with crop marks. When showing eyelet positions and/or wind slits or cutter lines on banners. Please supply the artwork file and a separate cutter file. Please ensure that both files are set to the same artboard size and are set to the same scale. Please supply a separate ai, eps, or pdf file with the cutter or eyelets marks. Banner World can not be held responsible for any spelling errors / typos / incorrect telephone numbers, or improper setup of files. If we believe that a file is incorrect before production we will contact you and request a new file. We may refuse to accept files not suitably prepared for print. Any additional operations aimed at correcting files to the above guidelines and all changes made by Banner World upon the request of the customer shall be treated as an additional service and may incur an extra surcharge. How will I know if my artwork is ok? If we find any sizing / quality issues we will inform you prior to production. It is your responsibility to upload correct artwork. Will you send my parcel in plain unmarked packaging? Yes. No branding will be anywhere on our parcels. Is it possible to have an express mesh banner larger than 1.25m in more than one dimension? No this isn’t possible. Our max print width / roll width on Express Mesh banners is 1.25m. For larger mesh banners you would need to choose our standard mesh banner. Turnaround on standard Mesh is 6 working days, sometimes we can ship to you in 4 working days but there is an additional charge. Please contact us if you require a faster shipping on a larger mesh banner. What spec of eyelets do you use? We use brass eyelets on Express Banners with a 11mm internal diameter fixing hole. Eyelets are spaced approx 500mm apart unless otherwise stated. Can I have pole pockets on an express mesh banner? No, we cannot produce pole pockets on an express mesh product due to the additional finishing times. Can this product be printed double sided? No. This product is single sided printed only. Can you provide me with fire certification? Yes. Please download the certificate here.